On March 28 Florida had a successful tutor collaborative at Palm Beach Atlantic University in West Palm Beach. 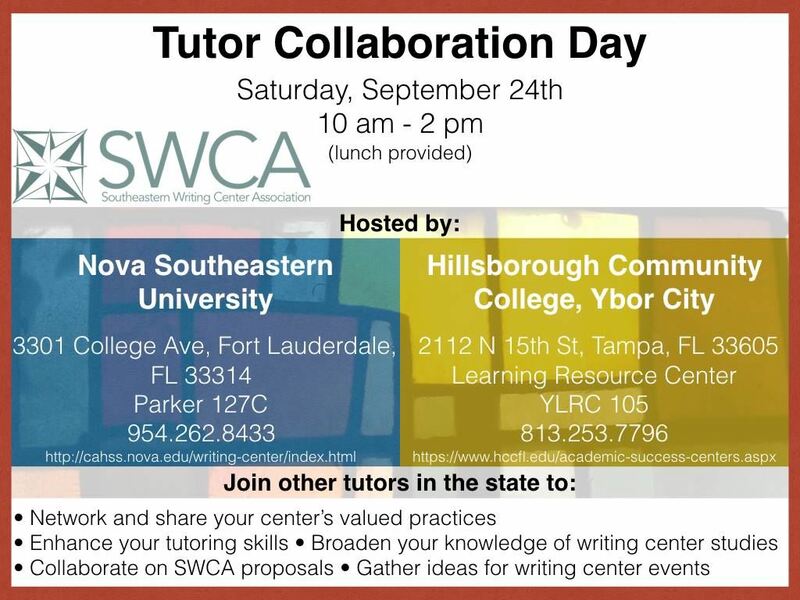 This was the first tutor collaborative in Florida, so we were glad to see 25 participants from four different schools (FIU, Nova, Miami Dade, and Palm Beach Atlantic). Lisa Marzano, Director of the Writing Program at Palm Beach Atlantic, did an excellent job in making everyone feel welcome and finding a great space for our discussions. Palm Beach Atlantic provided free coffee and lunch for everyone. She has a wonderful center and great staff of tutors. * CONFERENCE PROPOSALS: Participants shared ideas from their centers and discussed possible conference proposals for the IWCA conference in Pittsburg and NCPTW in Salt Lake City. We emphasized that travel scholarships are available and we formed groups to brainstorm conference proposals. * ZINES: We discussed how to make a zine and created some. * COMMUNICATION/COLLABORATION: Kevin Dvorak and his graduate tutor, Angelica, discussed communication styles with the “Yes, but/Yes, and” exercise and how to become better collaborators.